Quick: In what year did this happen? Artifacts in the wreckage bear unrecognizable "hieroglyphics"
Did you guess 1947? You're partly right -- or at least not completely wrong -- that is, if you believe the Roswell story. The year I was going for was exactly 50 years earlier: 1897. Surprise! 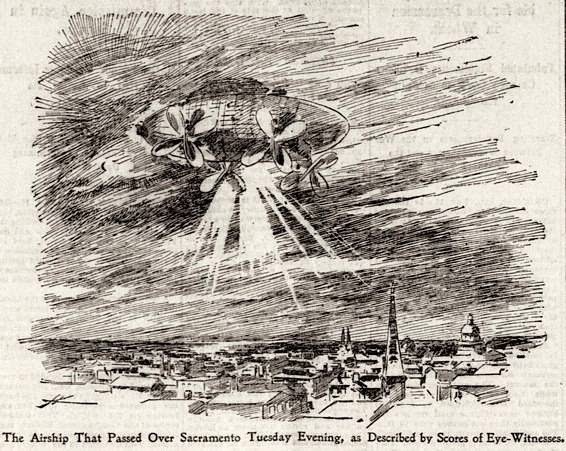 1897 is the year a strange "airship" was reported to have crashed just outside Aurora, Texas, after which the remains of the pilot were recovered and declared by the local government man to be "from Mars." I've been studying the case after reading an article my Dad recently sent me (about airship sightings here in Wisconsin), and the more I read about it the more I am amused by the uncanny similarities between the Aurora story and the Roswell story. It certainly seems to me that the Roswell story must have been "inspired" by the Aurora story; after all, Aurora "happened" first. You'd think it would be pretty hard to crash one of these things, but you'd be wrong. Then, in April of 1897, an airship was seen over Aurora, losing altitude and speed, as though it was malfunctioning. The ship crashed into the windmill on a farm and exploded, scattering debris over several acres and leaving behind the charred and disfigured remains of the pilot, whom the witnesses insisted was not of this world. 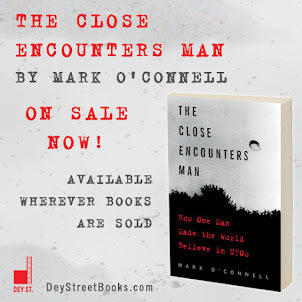 A local reporter wrote up the events in the Dallas Morning News two days after the crash, and that's the last anyone had to say on the matter until decades later, when UFOlogists rediscovered the story and started to investigate in that wonderful, wacky way UFOlogists investigate things. The biggest point of departure between the Aurora and Roswell stories is that the Aurora alien didn’t get spirited away to a secret base in Nevada, or hidden in a high-security hangar in Ohio. He wasn’t subjected to an autopsy and he didn’t appear on cable TV. His existence was neither leaked nor covered-up. Nobody has discovered 1897 Kodachrome slides purporting to prove that he was real. Nope, according to the newspaper report, the Aurora alien received a decent Christian burial at the town cemetery mere hours after the crash. He still rests there today, or so the story goes. Amazingly, none of the locals seems to have ever made any fuss about a spaceman -- who may or may not have a soul -- being interred in the same hallowed ground as their kinfolk, which just goes to show you how decent some people can be. This story fascinates me on a whole lot of levels, not the least of which is the unavoidable "copycat" factor where Roswell is concerned. Seriously, how could these two incidents -- apparently taking place exactly 50 years apart -- be so eerily similar, unless the later event was a complete re-boot and rip-off of the earlier event? And how could this guy, of all guys, seriously disparage the Aurora story? I'm still laughing at that. 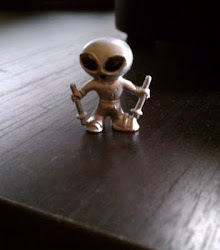 I think it's safe to say that the Aurora alien is every bit as real -- or as fake -- as the Roswell alien(s). But, personally, I'm rooting for the Aurora alien. FAST FORWARD TO ABOUT 17 MINUTES IN. That link takes me to a general YouTube page with dozens of videos. Which one am I supposed to watch? FAST FORWARD TO ABOUT 17 MINUTES IN. Somebody is reading your blog. Whoa... They're talking about my Million Intruder March!